A time may come when our loved ones aren’t able to live on their own anymore. It is a big decision to make, but Self-Help for the Elderly makes it a decision that you will be happy with. Living in an assisted living facility will improve seniors quality of living. Our Residential Care Facility for the Elderly (RCFE) houses seniors over the age of 60 in an assisted living facility. This facility hosts seniors with Alzheimer’s Disease and related dementias. If your loved one suffers from dementia, you know that their everyday life can be difficult. All dementia patients experience the disease differently and it can be difficult to take care of them on your own. Making the decision to put them in assisted living is a heavy one, but our care facility is a safe place for them to be. Room and board is provided along with personal care, 24-hour supervision, housekeeping and laundry services, structured daily activities, nutritious meals and snacks. Transportation and supervision are also arranged for their medical appointments. 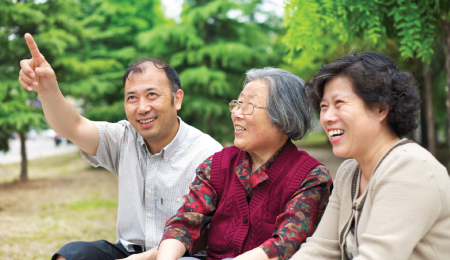 They are supported by home health aides that speak Cantonese, Mandarin and Taishanese to ensure clear communication. Seniors are provided with long-term care and supervision each and everyday under qualified and trained guardians. For many seniors, assisted living provides the care and assistance they need to flourish in their new phase of life. They will also have other companions to socialize with and participate in activities with. Residents that meet the HUD low income criteria are qualified to receive rental assistance. To learn more about our Residential Care Facility for the Elderly, contact Self-Help for the Elderly to decide if this is the right choice for your loved one.